Attach to Camera Rig via Clamps, Etc. The IndiPRO Tools Dual Nikon EN-EL15 Power System allows you to provide extended power to your Sony a7 Series camera. It features two hot-swappable Nikon EN-EL15 battery plates so you can power the camera continuously. An LED indicator remains lit as long as sufficient power is available and keeps you informed of the power status at all times. 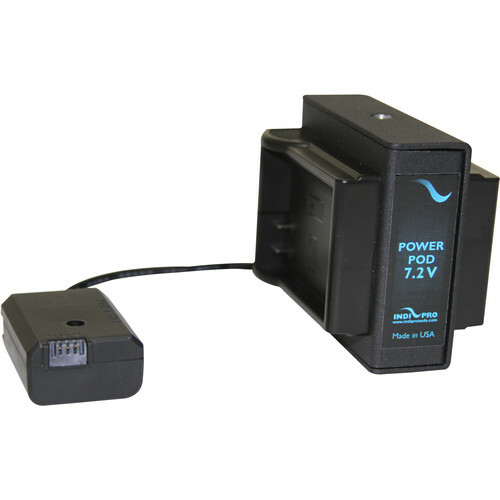 Additionally, the adapter also provides a 2.5mm DC output for simultaneously powering a second device using an appropriate cable, sold separately. Offered in a robust design with one 1/4"-20 mounting thread on top and one on the bottom, this adapter can be securely attached directly to your camera or camera rig using optional accessories. Use it camera-top by incorporating a shoe mount adapter, in which case you can additionally mount a monitor on top; or attach it to your camera rig via a rod clamp or other support accessory. Box Dimensions (LxWxH) 5.7 x 5.3 x 3.3"
Dual Nikon EN-EL15 Power System with Sony NP-FW50 Dummy Battery is rated 1.0 out of 5 by 1. Rated 1 out of 5 by Michael from Don't buy for RX10 Series! The Dummy battery has a gap on the end and that is positioned where the clip-lock needs to lock in the battery into place to make contact with the camera connections. It just won't stay in place when used in the RX10 II camera. Great idea, poorly designed.